Auckland’s most lively arts festival, the Whau Arts Festival, is back for 2016, and this year is launching a first for the city by running 24/7, with seven projects over 24 hours. That’s 24 hours of non-stop creative community collaborations and action, with each project running for exactly 3 hours, 26 minutes, and 11 seconds. Once the time is up for each project, it’s gone, and we’re on to the next one. This is a festival with no time for sleep! Alongside the core 24 hours of the festival, there will also be satellite projects happening in waiting rooms, traffic islands, in shop fronts and on walls around Avondale town centre, and a day of family-friendly activity on Sunday October 23. As established with previous festivals, this year’s festival will include a range of projects from Whau-based artists, as well as a number of projects where professional artists have teamed up with community groups to co-create work. Curated and hosted by the multi-disciplinary local arts collective Whau the People, this is a festival that aims to celebrate the rich creative diversity of the Whau area. 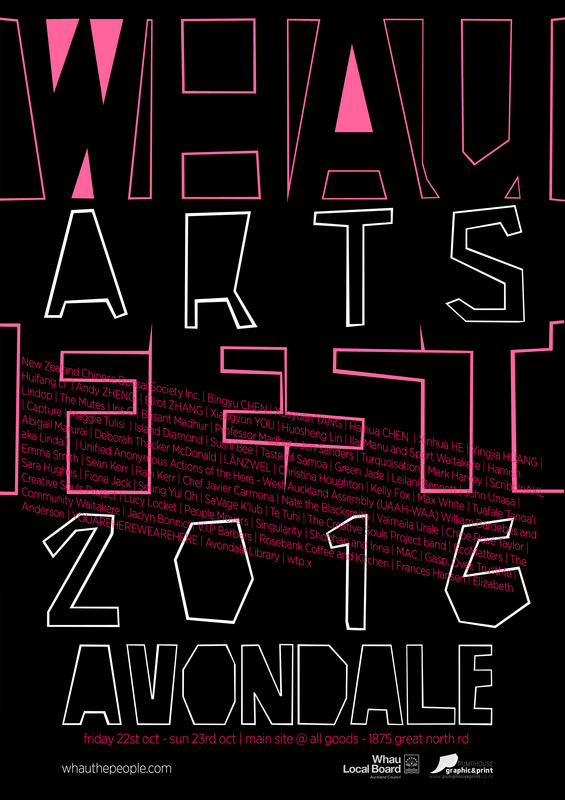 The Whau Arts Festival runs from 21 – 23 October, 2016, and will be centered at All Goods Whau Arts Space at 1875 Great North Road, Avondale. All events are free, thanks to the support of the Whau Local Board. Live painting of hip hop artists with John Unasa, Deborah Thacker McDonald and Abigail Marurai. You are invited to come and join in and draw or paint your favourite musician(s) too. Music with LĀNZWEL – he takes requests! 20:26 – Christina Houghton: ‘Whau (LO) ting Safely’ a ci-fi night walk. ‘Maraikai Event’’ a video work by Kelly Fox @ Tax Accountants, 2026 Great North Rd. 23:52 – ‘Midnight Viewing with LTTV featuring VHS’ with Linda T: choose a video from the temporary video library and grab some mates for a midnight screening. Visit Green Jade for fish & chips, bring back and chill. BYO. All Goods home brew available. 10am – 2pm: ‘Makers Space’ with Creative Souls, come and make. 2. Friday – Sunday: ‘Elected Artists’ artwork by Whau the People @All Goods on the street feat. MAC, Sean Kerr, Frances Hansen, Kelly Fox, Iris G, Javier Carmona and Lind T.
4. Friday – Sunday: ‘Welcome to Avondale’ with Gasp, Over, TrustMe. A mural. 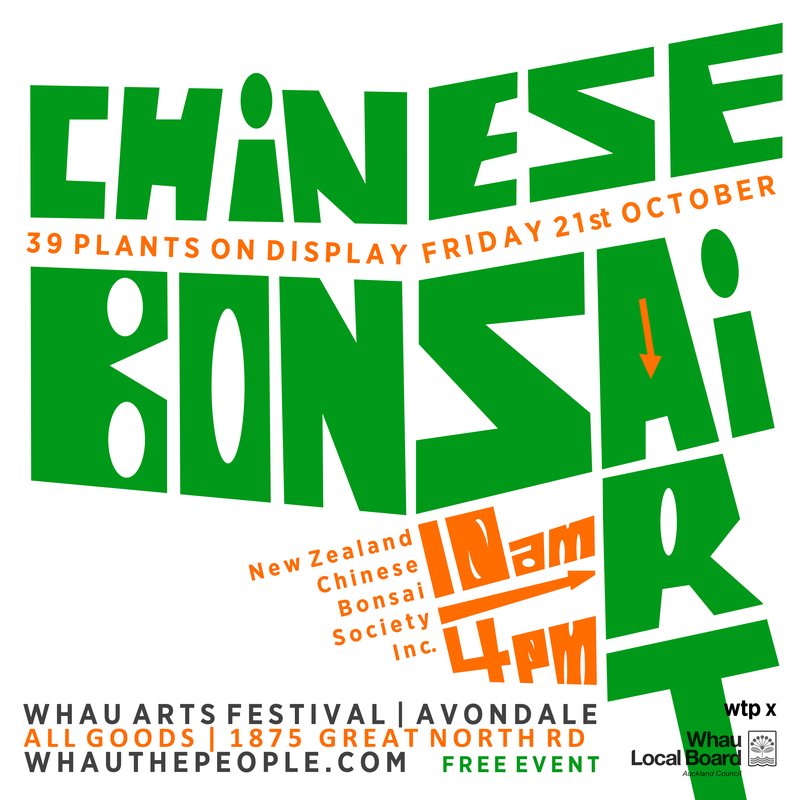 We will showcase Chinese bonsai art to visitors of the Whau Arts Festival 2016. The 39 finely selected artworks are created by our members. Some of these living artworks have been maintained for more than 20 years. It covers a wild range of plant species such as pine tree, tea tree, etc. A lot of our artworks are made of local plants. Our artists present them in various and genuine Chinese bonsai designs including single trunk, lean trunk, forrest, fruit, flower, water/land, landscape, etc. It reflects the oriental philosophy of human life and the environmental Yin Yang balance through the shape of the artworks. The artworks are valuable. Only one touch may cause damage which is not remediable. Please don’t touch any parts of the artworks, including the leaves. New Zealand Chinese Bonsai Society Inc. is committed to practise and promote Chinese bonsai art in New Zealand. Bonsai art originates in China 1200 years ago. It reflects oriental philosophy of being environmental friendly and creating Yin Yang balance in human life. Xueyuan YANG, whose native place is Zhenjiang city of Jiangsu province in China, is the founder of New Zealand Chinese Bonsai Society Inc.. He practised bonsai art from 1980s, building up his own bonsai garden. Since he immigrated to New Zealand in 1998, he began to create bonsai artworks seedling with native pine. Mr. YANG has given complimentary bonsai workshops to local fans at his garden in Auckland for years. In the mean while, he expressed knowledge of Chinese bonsai to local communities as a volunteer tutor. Mr.YANG organised conversations between Chinese and local Kiwi bonsai artists. His fine bonsai art works were appraised in a few of art exhibitions. In 1998, he was invited to give a Chinese Bonsai presentation in the International Bonsai Expo. Xinhua HE is the secretary general of New Zealand Chinese Bonsai Society Inc. He likes gardening and bonsai art. There are 6 years that he has been creating bonsai. His favour style of bonsai is landscape which provides beautiful blending of poems and paintings in his bonsai art works. Those bonsai gained appraise in various art exhibitions in Auckland. Huifang LI has been a member of New Zealand Chinese Bonsai Society Inc.. for 11 years. She learnt bonsai art when she was in China. After moving to New Zealand, she found that in New Zealand various types of plant provides unlimited opportunities to create bonsai art works. Ms LI devoted herself in this art. She focuses on bonsai styles of tree, flower, fruit, water/land and hanging. Recently, Ms LI promotes Chinese bonsai our communities. She believes that bonsai art is ideal to help people close to nature and enjoy the environment build up. Andy ZHENG has been a member of New Zealand Chinese Bonsai Society Inc. for 6 years. He was introduced to bonsai art by a friend in an occasion. He was impressed by the beauty and knowledge which was well presented on a tray. Since then, he made efforts of learning and creating bonsai art, especially water/land style. Now he specialises with make to measure trays. This service helps bonsai artists crossing the boundary of containers. At SPORT WAITAKERE, our purpose is to make a positive difference in the lives of people in our community through sport & recreation. We do this by providing sport & recreation programmes, events, training and support at no cost or low cost. We believe in the value of sport and that everyone deserves the opportunity to participate. Happy to support any community initiatives in the Whau. Create robotic art with robotic cubelets from Avondale Library! Hands on Creatures is a traveling interactive and educational show of our beasties where we visit child care centres, schools, birthday parties, field days or anyone excited to see our menagerie. The Mutes have gained a reputation for their infectious live performances from their tours of the North Island and performances at a number of festivals. A hightlight for the band was performing at the Whangamanta Beach Hop in 2014. This tour was filmed for a documentry on Atitude TV. They released a CD ‘Just Us’ in 2014 and are currently recording new materaial for release later in 2015. The band write and perform their own material. The Mutes are a unique rock / pop band out of West Auckland. What makes them unique, beyond their undoubted musicianship and songwriting ability? The majority of members have an intellectual disability in some form. Their creative passion and commitment to performing connects the disability culture with that of the rock music community. They are the only integrated musical group / rock band of its kind in New Zealand. The Mutes are Jared Barrington, Gabe Ashby, Miranda Mills, Lisa Hannam, Jonathan Gill, Nathan Child, and Sam Benge. I’m Iris G, I like to dress up as a gorilla named Iris G-rilla and I used to have a bowl cut! I’m an 18 year old singer/songwriter who recently won first place in the Solo/duo category of Smokefree Rockquest 2016. You can expect me to be dancing with my happy feet! is a widely acknowledged Tabla player and a much respected artiste in the arena of Indian Classical Music.On account of his versatility and pleasing disposition, he is the most sought & creative artist in the realm of Indian classical music in New Zealand (Australasia). Born in the family of musicians, he took early training from his elder brother Deepak Madhur and received expert guidance from Punjab gharana tabla maestro late Pt Pawan Kumar Verma. During his college period, he received numerous awards at state, zonal & national level youth festivals. At the same time, All India Radio & Television approved him as a performing artist at AIR & television, Shimla. Moved to New Zealand in 2002 and established ” Sargam School of Indian Music ” in 2006, trained more than 300 students and also created high level students. He also received the award of Appreciation for his contribution in the field of music by GOPIO. Global organization of People of Indian Origin New Zealand. He had an honor to accompany some of the stalwarts of Indian Classical Music such as, Grammy winner Pt Vishwa Mohan Bhatt in NZ & USA. Pt Ronu Majumdar in NZ & Australia, Pt Rakesh Chaurasia, saxophone genius dr kadri gopalnath, patri satish kumar to name a few. He has also collaborated with several western musicians like John Ellis, Luke Hurley, Murray McNabb, Frank Gibson Jr, Jon sanders, Prosad in fusion music. Other than being a regular feature in many music festivals in New Zealand, he was invited to perform in India, Australia and USA. Professor Shuk Dev Madhur, retired lecturer of music, he is known to New Zealanders as a violinist proficient in the Indian classical music. His passion for the art has made him a quality teacher encouraging a growing number of youngsters to learn violin under his able guidance. Professor Madhur is a recipient of several Awards, among the foremost of which is the National Award that he received from former Indian President in 1993. Professor Madhur is largely responsible for bringing Hindustani Style of music to the NZ, giving it the global audience it enjoys today. He spends his time between India and New Zealand. When here, he teaches at the Sargam School of Indian Music. Violin Concerts of Professor Madhur have been featured in innumerable Music festivals & conferences all over the New Zealand & Australia. Some Of his Unique performances also include music concerts at Asia 2000 Foundation of New Zealand, Prana Music, dance & arts Festival, waitakere Indian Association, Pakistan Association of New Zealand, Bharatiya Samaj’s Fund raiser in New Zealand, Auckland Council Community events. Professor Shuk Dev Madhur, true cultural ambassador of India, continues to preserve and spread the rich cultural heritage of Indian classical music, in all its glory. Jon Sanders has been at the forefront of musical fusion projects for over 20 years, drawing on musicians and musical styles from the seven continents as his two proclaimed albums reveal, Latitudes and Twigs of the Neem Tree. In recent years he has been particularly attracted to the mesmerising sounds and rhythms of Africa and India. The last couple of years has seen Jon and Basant join forces in an east meets west show in a musical jousting that has delighted crowds. This concert will launch some brand new compositions from his forthcoming third album due out later in 2014. Do you want change in your life? Do you want to be part of New Zealand’s fastest growing social movement? Do your turquoise levels need recharging in preparation for the coming storm? If so, be part of the solution by participating in this performance that encourages groupthink by appealing to the human willingness to follow and desire to belong. commissioned by Te Tuhi, Auckland. ScribbleAKL is a weekly creative mixer that brings together thinkers and doers from a range of disciplines to talk, share ideas and give and receive feedback. Since establishing in 2011 there have been over 200 and multiple interactive events collaboratively created by the community. Maggie Tulisi is a local resident of Avondale who teaches Siva Samoa classes for young girls under Sau e Siva West Auckland aka (SESWA). “Capture” – The pain of losing someone close lingers and through the fog like state of grief we can miss the messages sent to us from the higher realms of spirit that our loved ones are always around us. *Capture* – The dream state of our yearning to see, hear and feel for the loved ones whom we have lost. CAPTURE – The moment when life within you slowly reappears in the knowing that one day soon you’ll be reunited with the Moon. Maggie’s love and passion for Siva Samoa sees her extend her artform into the contemporary and she hopes the performance ‘Captures’ YOU the audience and takes you on a journey of love and light. “My name is Vasa and I am the owner of Island Diamond takeaways, I’m of Tongan descent and live and work in Avondale. My husband Poni is also Tongan and we have been married for 22 years, we have 5 children and 1 grandchild. After working for 24 years powder coating for a locks company I hurt my knees and had a couple of operations. I wasn’t able to stand for long hours. I left my job 2 years ago and decided I was going to run my own Island Takeaway’s. That was the goal. My husband loves cooking and taught me a lot of different recipes but to be honest I don’t have any secret recipes. This is food us Islanders grew up eating back in the islands, taro leaves and lamb, raw fish, chop suey…its food that was made for a Sunday feast. Just food made with love. I finally reached my goal on July the 14th 2016 when we had our opening. Thanks to the help of my husband, children, family and friends. It’s hard work but it’s all worth it when people are happy and leave with a smile, or you can hear them enjoying their meal. I cook my food as if I was cooking for my own family, cooking with love. This is the story of how the name Island Diamond came about. My grandfather once told me – there are 3 things that are important in life number 1 is God, second is food and number 3 is have a roof over your head. We have been here in Avondale for 1 and a half years. We live in Blockhouse Bay and our son Joshua goes to a school in Blockhouse Bay. We have been here in Avondale for 11 years. The Green Jade is a community and family favourite when it comes to fast food restaurants in Avondale. The Green Jade is a Go To for locals and give you great value for your money. They offer a variety of food from fish and chips, drum sticks while you wait for your food to Burgers, Fried Rice, Chow meins you name it. The Green Jade is iconic in Avondale and are always packed. They are open from 11am to 10:45pm Monday to Sunday so go down and check them out. Artists John Unasa, Abigail Marurai, and Deborah Thacker Mcdonald will be drawing and painting portraits of popular hip hop/rap artists directly on the wall. Inviting members of the public to also draw their favourite musician/s creating a vibrant wall of portraits! A Samoan artist based in the Whau for over 30 years. A BFA graduate of Whitecliffe College of Art and Design, John also holds a BA degree in Political studies and art history from the University of Auckland. Specialising in Graphic design and painting his art is inspired by the Italian renaissance, cultural icons, Polynesia and the wonders of creation. Abigail Marurai is a visual artist born in the south Waikato. Her connection to the whau is through friends and work colleagues, she has a strong connection to her Cook Island roots. Abigail works with Photography, drawing and painting, her inspiration is drawn from her family and her ancestral history which gives her passion and motivation. Deborah is a Cook Island Visual Artist, whose work is based around Photography and moving image she has a strong connection to the Whau as she was born and raised on the boarder of New Lynn and Avondale, She is a mother of four children with a diploma in Creative arts and due to graduate from her Bachelors degree. is an all round multi talented entertainer & performing artist. A singer-songwriter, one-man-band, multi-instrumentalist, dancer, comedian, actor, entertainer, music & performing arts tutor. His creativity & original flare captivates you leaving an unforgettable experience. An enjoyable & versatile performer to watch. This multi talented artist has an exciting journey & promising career ahead of him. A “Cli Fi” performance walk at night through Avondale exploring survival through post human narratives and somatic actions. We will circumnavigate rising sea-level maps that suggest Avondale might one day be a sea-side town while reclaiming his/her story of places for walking safely as a performative artistic resistance. Whau (Lo) ting Safely in public is an act of recovery for the edges of urban spaces suggesting new narratives for survival in the present and the future. A slide Show which records the 2009 fire that destroyed the old tram barn buildings at the Jude Street Roundabout in Avondale. The sequence covers the fire, demolition and clearance of the site. And continues through the 2012 replacement build of ‘Carl’s Junior’ and associated food outlets. You can join Christina Houghton’s “Cli Fi” performance walk to see this work on route. Kelly fox is an Auckland-based documenter who works primarily with film. His approach is uniquely informed by a consideration of what it means to be hearing-impaired. At age 3, Kelly learned that he was born deaf. Looking to give him the best opportunities in life, when he was 5 years old, Kelly’s parents moved their family to Avondale so that Kelly could attend the Kelston Deaf Education Centre. There, Kelly learned to both sign and speak, as he wanted to still communicate with the rest of his hearing-capable family through speech. Recently, Kelly has been creating documentation of live events that feature him signing to the camera. He purposefully makes his videos for the deaf and hearing communities alike, subtitling his signing with captions. To date, Kelly has been sharing his short films with his friends and family through Facebook. During the Whau Arts Festival 2016, it will be the first time Kelly is sharing his video work in a physically public space. He will also be filming during the Whau Arts Festival Opening. Maraikai Event – Video @ Tax Accountants, 2026 Great North Rd. Tuafale Tanoa’i aka Linda.T is an artist based in Tāmaki Makau Rau and is of Samoan descent. In the hours before dawn breaks join Linda .T and her interactive installation of TV screens and a curated library of VHS movies. Genres include ‘Female Protagonist, Kid friendly, Film Festival, Documentary, LGBTQI, locally made recordings, Bruce Lee and more. Alongside the VHS library there will be a selection of short 2016 docos from the LTTV Archive available for your viewing pleasure. Linda .T’s long running connection to Whau is largely due to her close extended art family that are exhibiting, working and raising families in the Whau area. Using video, photography and DJ-ing Linda. T’s practice aims to document and share community stories, generating a living archive. Her kaupapa has been described as one that is based on koha – often made with and gifted back to the communities she is engaged with. A Masters in Art and Design from AUT as well as an early career in local radio, TV and short film contribute to her methodology and multi media approach. Linda. T is widely recognised for her contributions to small communities in Aotearoa, New Zealand through her rigorous and uncompromising chronology as a documenter since the early 1980’s. In addition to her solo practice Linda T. is a member of art collective D.A.N.C.E. art club alongside Vaimaila Urale, Chris Fitzgerald and Ahilapalapa Rands. With a collaborative curatorial approach, D.A.N.C.E. events incorporate installations, music, performance, and food sharing, reimagining the social dynamic as a creative and transgressive platform. The modern roundabout is a wonderful example of mutually co-operative consent to shared rules of control. It is also a space of community display. These shared spaces are generally maintained in stasis against forces of disruption or decay. For two years the Unified Anonymous Actions of the Here – West Auckland Assembly (UAAH-WAA) has been experimenting with various interventions at road circles in Sunnyvale, west Auckland; activating this shared space with material and object placement and engaging with the forces that the circles have generally been maintained against. The UAAH-WAA is excited to extend the method and practice established by the assembly participants at this previous Sunnyvale Circle over several weeks at selected traffic islands throughout the Whau area. This will culminate in the presentation within the All Goods space of a live material response to the originating Sunnyvale island, as an open-ended archival presentation of the UAAH-WAA’s actions over the last two years. The UAAH-WAA is committed to existing as a loosely formed coalition of materials, actions and environmental forces. The West Auckland Assembly treasures anonymity as a method for maintaining the assembly members as non-hierarchical participants. The actions of the Assembly are focussed on providing activation to spaces inbetween their routinely provided definitions. Through this site activation and by engaging material in its own agency, the UAAH-WAA hope to draw into conversation the forces of control, repair, and decay. The UAAH-WAA was triggered by an anonymous action at a traffic island in Sunnyvale West Auckland in 2014. Since then this Sunnyvale roundabout has remained the focus and inspiration for the West Auckland Assembly’s actions. After two years of casual driftwork at and around the Sunnyvale site, ‘AROUND ABOUT INTERVENTION’ is the first coordinated activity by the UAAH-WAA. The West Auckland Assembly is excited by the opportunity to extend our participants action into the lovely Islands of the Whau! The land we know is a collaborative digital animation project between William Bardebes and Emma Smith. Vast tilt wall buildings, empty fields, fluttering flags, distended silos and obsessively manicured gardens document a landscape of industry, neglect, and declamatory occupation without presence. To the tune of a car freewheeling (engine off), sheet ice quietly cracking and ambient casino purring, this grey place forces territorial intent to the fore. Will and Emma have lived in the Whau catchment for the last five years. This is their third collaborative project for the Whau festival. Playing it safe – Sean Kerr with Ravi Kerr, Technical support. Playing it safe, A 3hours, 26minutes and 11seconds kinetic event performed in a safe. Playing it safe; randomly for 3hours, 26minutes and 11seconds an array actions will happen within the safe. The various actions / happenings are: a pneumatic beat machine that beats a Mercedes hub cap stolen from the banker’s car, an old banker’s hair piece on a pneumatic slide that slides back and forth , a farting speaker that banks farts, a singing light that sings “We’re in the Money” , a pneumatic horn that randomly bugles a warning that someone is in the safe , safe doors and cupboards automatically open and close , a TV screen displaying what is going on in the safe and counting everything that happens , and finally a compressor that tops up every so often that supplies air to the pneumatic solenoids. Chef Javier Carmona is creating edible items in response to 7 artworks by 7 different artists, magnifying your art experience. Free, all welcome! Spanish born and Sydney raised, Javier Carmona has been working as a chef for more than 27 years. An early fascination with the arts led him to cooking; a creative outlet that saw him embark on a journey, travelling the world and working in the kitchens of Europe and North America. Relocating to Auckland, New Zealand, Javier joined the BHC group, helping to open one of Auckland’s newest and busiest restaurants, Mexico, transforming Mexican food and changing perceptions around the origins of ancient cuisine. Javier went on to establish himself as Executive chef across all concepts at the Mouthful group, including Mexico, Orleans, the newly opened Beirut, serving contemporary Middle Eastern cuisine in a rough and beautiful dining room, to Oaken, with its artisanal feel and imaginative spin on all things breakfast. Javier was recently nominated in the Best Chef and Best New Restaurant category at this years Metro magazine awards 2016, as well as taking Beirut to Cuisine’s Good Food Awards 2016. Installation of Exercise machines form inorganic collections and exercise video to get you moving to. The Community Recycling Network is the representative organisation of existing and emerging community groups involved in recycling, reuse, composting, waste reduction and waste education. One path to sustainability lies in recovering the valuable resources currently flowing into our waste streams. Working together towards a Zero Waste future enables communities to protect and enhance their local environment and social economy. YOUAREHEREWEAREHERE is an ambiguous group that intervenes into the institutional rituals that frame socially engaged art. This collaboratively driven project specifically experiments with the promotion and reception of art through a series of online works and live events. Music, art, community and more! We love art and craft that uses natural materials and gives folk a chance to creatively express themselves without the use of plastic or toxic material. EcoMatters Environment Trust is a non-profit hub where people come together to share ideas about living well. Through hands-on community engagement, EcoMatters provides the means by which people can build awareness of current local and global issues, and join the movement for social and environmental sustainability. Makers Days are about coming together to make/create for a cause. Learning new skills, working together while creating hints that mean something. Bug’s Breakfast is combination of glove puppetry and story-telling and features aspects of a familiar kid’s storybook! This show is ideal for pre-school aged children, however can be enjoyed by all. All Lucy Locket’s puppets are hand made, using upcycled materials, which will delight and inspire your children’s imagination. Whau resident Lucy Locket (Lucy McCammon) works an actor, drama teacher, children’s entertainer and puppeteer, as well as being a regular volunteer space minder at the awesome ALL GOODS WHAU ARTS SPACE. Lucy has toured her puppet shows at numerous Auckland Kindergartens and childcare centers and performed at Whau Arts Festival in 2014 and 2015 and at Out of the Suitcase Puppet Festival in Wellington 2015 and at The Christchurch Puppetry Festival 2013, 2014 and 2015. We are Rachel Ruckstuhl-Mann and Clare Luiten. We go by the name People Movers. We create and facilitate performances, opportunities for movement, questions, encounters, art, food and other stuff. As an ongoing studio practice space we are offering Friday Morning Moves from 10-1pm every Friday at The Auckland Old Folks Association on Gundry Street, Newton, Auckland. This is a participatory experience, open to all to who would like to engage with the material, movement or each other. This is for all ages who might like to get their feet feeling some food. We will be undertaking the task of creating a dish for the enjoyment of participants and audience members. This dish will be created over a number of hours, and will be not simply prepared through kitchen utensils and food ingredients, but will be an experience of bodily sensation, possibilities for movement in response to or in necessity of the dish’s requirements, and the relationship between (food) material, bodies and space. Singularity is an Auckland based group who have been performing acoustic environmental improvisation since 2013. Hand painted the cross street banner. Artist from the Philippines currently based in Avondale. For the love of street and modern art, Over explores the aesthetics and depths the world we live in. Mainly diversifies his art by the use of surrealism, socio political themes and futurism. Over loves to work with colors and would love to be involved in every community and light the streets up. “Welcome To Avondale” is a co-authored mural between frequent collaborators Gasp and TrustMe and their new found friend Mac. It’s a homage to the community of business’ and people that are based in the central Avondale shops. Drawing on signage as a way of establishing a local vernacular, this painting is simply about noticing some of the little things that go into making a place what it is. Over is an artist from the Philippines currently living in Avondale, Gasp is a long time Auckland graffiti artist who has at times lived in Avondale and TrustMe drives through Avondale on a daily basis. VOICES re-presents Avondale conversations word for word. Play, fast forward, rewind or pause. This sound installation is an extension of an earlier community arts project, LOCALS. VOICES is a community collaboration with a collection of local residents, businesses and community spaces. Community Waitakere is a community development agency delivering neighbourhood and environment-based projects and programmes, training, information and connection to the community sector. Jaclyn Bonnici of Community Waitakere coordinated this project and lives in Avondale. I paint and I collect things to generate ideas to paint. Sometimes the things get put together and become the paintings, like these works I am presenting, Landscapey. Groups of similar objects become a set, portraying a new sense of belonging. It feels like resuscitation has occurred. My process becomes circular, once I place these back in the window of my local op shop. A Journal – Yee Haa! Why pay for an expensive journal?Instead of Local artist, etc please put – In this workshop, local artist, Elizabeth, will show you how to get started and give you a few drawing ideas to get started. Bring any markers or felts you have as these work best on print paper. There will be a variety available. Elizabeth Anderson, born in Island Bay, Wellington studied graphic design at Wellington School of Design (1976 -78) and worked as a graphic designer in print design studios and BBC television in London. Elizabeth taught secondary school art in the late 80’s. She completed a Postgraduate Diploma and Master of Fine Arts from 2000-02. She has exhibited in various exhibitions since leaving teaching and has contributed to the Whau Art Festival each year. Come and be creative! Help paint and decorate 12 tyres and plant them up with flowers, for a garden over the summer months.